Brittany Kink Toigo joined Barber, Segatto, Hoffee, Wilke & Cate in 2011 after graduating from Southern Illinois University School of Law. Ms. Kink concentrates her practice in the areas of divorce, child custody, visitation, child support, parentage, antenuptial agreements, wills & estate administration, structured settlement payment rights, personal injury and bankruptcy. 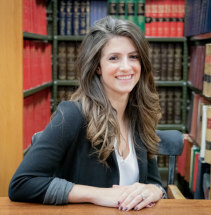 She is licensed to practice law in the State of Illinois as well as before the Central, Northern and Southern Districts of Illinois Federal Court, the Bankruptcy Court and the Seventh Circuit Court of Appeals. Ms. Kink is a member of the American, Illinois State and Sangamon County Bar Associations.